Summary: From a young age, Bean has had to take care of herself. With a mother who continually brings home abusive boyfriends and a father who raped her when she was six years old, Bean has no other choice. Her mother’s new husband terrorizes their family with violence and intimidation, but what Bean doesn’t know at the time is that her younger sister is now the one being taken advantage of. Looking back over the memories of her childhood, Bean examines each carefully, slowly putting the pieces together and realising all of the past trauma she has been suppressing. Her reflection sparks new realizations, hopefully giving her a new foundation to build her future life on. Review: Like yesterday’s Necking With Louise by Rick Book, Mostly Happy by Pam Bustin is another contemplative read. Bean has a suitcase that holds memorabilia from all of the important moments of her life, and the story is about her examining each of the trinkets one by one. I did care about Bean. Truly horrible things happened to her again and again. She never deserved it, and I never blamed her for taking care of herself when she needed to. She was her own best ally. Bustin’s writing is skilled and smooth, but seems to underplay everything Bean has actually gone through. Even though this is initially because Bean herself is repressing everything, when Bean does come to face the truth she still doesn’t name what happened to her. She has some anger toward God, but still attends a bible college. Physically, sexually and emotionally abused, not to mention raped on several occasions, Bean seems remarkably minimally affected by her experiences. What I have trouble understanding is the mixed message of Bean’s sister’s story. Also abused and raped, Dee repeatedly tries to committee suicide. Bean can’t take responsibility for her sister’s actions, and yes, Dee is responsible for the decisions she makes, but I felt her story was more believable than Bean’s. She just seems more affected by what has happened to her in the past, although it’s kind of written off as her being attention-seeking. Her pregnancy was a surprise though, and did cause her to make some positive changes. In a way I thought Dee was better equipped at dealing with her feelings than Bean was, because she was able to admit something was wrong. While portrayed as a victim, Dee does make good and bad choices. It’s not black and white. I wanted to know more beyond the idealized memories Bean sometimes has of what happened. I also am left with an overwhelming desire to reread From Anna. “My hands started to shake. My throat hurt. I wished I could cry. I couldn’t remember the last time I cried. I wished I could slip out of the body – but I couldn’t. No jangly guitars, no watching from above. Just tea and aching. I had left home. 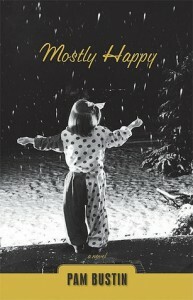 Mostly Happy by Pam Bustin, is published by Thistledown Press, (2008).